The Hon’ble Mrs. Suman Agarwal, Chief Justice and Her Companion Justices of this Hon’ble Court. 1. The petitioner Nos. 1 is a company incorporated under the provisions of Companies Act, 1956, having its registered office at the address mentioned in the cause title above. The petitioner No.2 is a director/ shareholder of the petitioner No.1. The petitioner No.2 is vitally interested in the affairs and functioning of the petitioner No.1. The petitioner No. 2 carries on his business through the instrumentality of the petitioner No. 1. The petitioner No.2 is a citizen of India. 2. The respondent Nos. 3 and 4 discharge statutory functions under the West Bengal Land Reforms Act, 1955 (hereinafter referred to as the “said Act”). The respondent No. 4 is authority concerned for effecting mutation the Record of Right. The respondent No. 4 is inextricably linked to the cause of action of the instant application for the reasons as more particularly stated here under. The respondent Nos. 1 to 5 are state within the meaning of Article 12 of the Constitution and are thus amenable to writ jurisdiction. 3. The petitioners by a registered Deed of Conveyance dated 28.05.2012 purchased a property approximately 18 Cottahs 8 Chittaks and 6 Square feet of land (hereinafter referred to as the “said property”), details of which are more fully and particularly described in the Schedule hereunder given. The petitioners crave leave to refer to a copy of the registered Deed of Conveyance at the time of hearing, if necessary. The petitioners had purchased the said property for developing the same. 4. The property was purchased in the year 2012. After purchase of the said property, the petitioners have in sole and absolutely possession of the same. The petitioners are the owners of the said property. 5. After purchase of the said property, the petitioners approached the concerned Block Land & Land Reforms Officer being the respondent No. 4 herein for deposit of khajna/land revenue for the purpose of effecting mutation of their names for correction/modification of record of rights. 6. Prior to the purchase of the said property, the predecessor-in-interest of the petitioners had represented themselves to be the owners and/or rayats in respect of the said property. The petitioners were furnished with a copy of the relevant land records to exemplify such fact. The predecessor-in-interest had furnished the petitioners with a copy whereby the name of the predecessor-in-interest of the petitioners was recorded as rayat in respect of the said property. Based on such assurance, the said property was purchased by the petitioners upon payment of huge amount of consideration. 7. However, after the petitioners approached the respondent No. 4 for payment of khajna for effecting mutation, such payment was refused. The petitioners were not given any reason for such refusal. The petitioners were verbally informed that land revenue could be accepted only after permission from the respondent No. 4. As advised, the petitioners preferred an application before the respondent Nos. 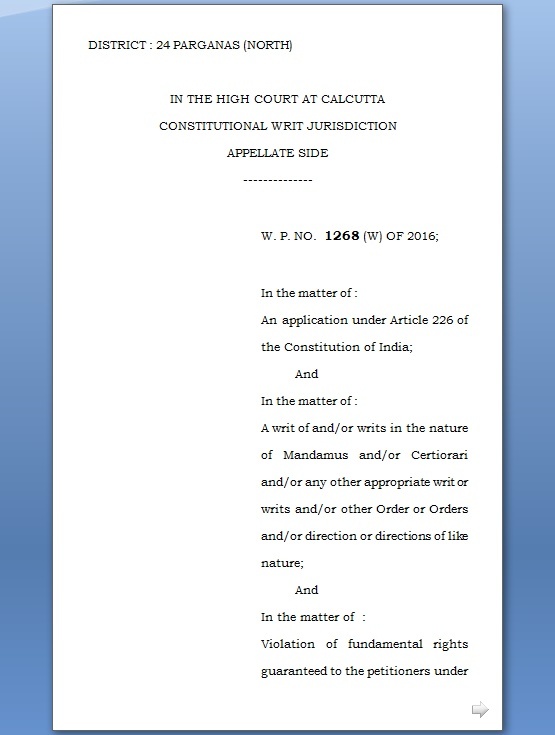 3 and 4 dated 27.8.2015, copies whereof are annexed hereto and collectively marked as Annexure “P-1”. 8. The petitioners further visited the Office of the respondent No. 4 on 4.12.2015 and to exemplify that the said property has been owned and being in possession of a private individual since the 74 years. The chain Deeds, to which the petitioners crave leave to refer to at the time of hearing, if necessary were further produced. The petitioners further visited the Office of the respondent No. 3 to establish the aforesaid facts to allow the petitioners to deposit the land revenue for the purpose of mutation, in respect of the said property. 9. The petitioners had purchased the property in the year 2012 as stated above. Prior to the purchase of the said property, the petitioners had been forwarded relevant extract of the land records pertaining to the said property whereby the predecessor-in-interest was recorded as rayat. In spite of several verbal requests, the respondent No. 4 had refused to divulge any information and/or particulars for non-acceptance of land revenue/khajna in respect of the said property. 10. The petitioners had purchased the said property with the intention of construction of a residential apartment. A plan for construction of G + 5 storied residential building was duly sanctioned by the concerned municipality on 25.10.2013. The petitioners crave leave to refer to a copy of the said sanctioned plan at the time of hearing, if necessary. In furtherance of the above endeavor, it is imperative that the petitioners are allowed to deposit the land revenue/khajna in respect of the said property, to enable the initiation of process for mutation of the name of the petitioner No.1 in the land record consequently. 11. In spite of receipt of the aforedated representations and despite having knowledge of the aforesaid fact, the respondent authorities have illegally and arbitrarily failed to accept and/or allow the petitioner to deposit the land revenue/khajna in respect of the said property. 12. The respondent authorities have failed to discharge statutory obligation. The respondent authorities have acted contrary to the provisions of the said Act. 14. In such fact, it is imperative that the respondent authorities are directed to receive the land revenue/khajna from the petitioners in respect of the said property to enable the petitioners to take steps for effecting mutation of their names in the record of rights. 15. The said property was purchased by the petitioners for developing the same. The illegal and arbitrary inaction on the part of the respondent authorities has resulted loss in the business. The petitioners’ rights guaranteed under Article 19(1)(g) of the Constitution have been violated. 16. The petitioners are gravely prejudiced by the inaction on the part of the respondent authorities in refusing and/or neglecting to divulge information in respect of the true and correct status of the said property. 17. The respondent authorities are acting in a highhanded and capricious manner in failing and/or refusing to accept land revenue/khajna in respect of the aid property. 18. The respondent authorities are acting in a manner that is proscribed by Article 14 of the Constitution of India. For that the respondent authorities have failed to discharge statutory obligation. The respondent authorities have acted contrary to the provisions of the said Act. For that in such fact, it is imperative that the respondent authorities are directed to receive the land revenue/khajna from the petitioners in respect of the said property to enable the petitioners to take steps for effecting mutation of their names in the record of rights. For that the said property was purchased by the petitioners for developing the same. The illegal and arbitrary inaction on the part of the respondent authorities has resulted loss in the business. The petitioners’ rights guaranteed under Article 19(1)(g) of the Constitution have been violated. For that The petitioners are gravely prejudiced by the tinaction on the part of the respondent authorities in refusing and/or neglecting to divulge information in respect of the true and correct status of the said property. For that the respondent authorities are acting in a highhanded and capricious manner in failing and/or refusing to accept land revenue/khajna in respect of the aid property. For that the respondent authorities are acting in a manner that is proscribed by Article 14 of the Constitution of India. 20. There is no other speedy, and/or efficacious, and/or alternative remedy open to the petitioners and the relief as prayed for herein below, if granted, would afford adequate relief to the petitioners. The respondent authorities have refused to accept the land revenue, which is the pre-condition for taking steps for mutation of the names of the petitioners in the record of rights. The petitioners have no other alternative and efficacious remedy. 21. Your petitioners have not filed any other proceedings either in this Hon’ble Court or in any other Forum on the self same cause of action. The reliefs as prayed for herein, if grant, would afford complete remedy to the petitioner. 22. Your petitioners state that the records of this instant case are lying in the office of the respondents outside the Appellate Side Jurisdiction of the Hon’ble Court. 23. The balance of convenience is entirely in favour of passing of orders as prayed for hereinafter. 24. In the facts and circumstances of the case, any formal demand of justice would be an idle formality. 25. Unless orders as prayed for hereinafter are made, your petitioners will suffer irreparable loss, prejudice and injury. (g) Such further and/or other order or orders be passed, and/or direction or directions be given as to this Hon’ble Court may deem fit and proper. And your petitioners, as in duty bound, shall ever pray. 1. That I am the petitioner No. _____ herein and as such I am well acquainted with the facts and circumstances of the above case. I am competent to affirm this affidavit. 2. That the statements made in paragraph Nos. ________________ are true to my knowledge and those made in paragraph __________ are my respectful submissions before this Hon’ble Court. Prepared in my office The deponent is known to me. This the day of January, 2017.